Talk about a tent with a view! 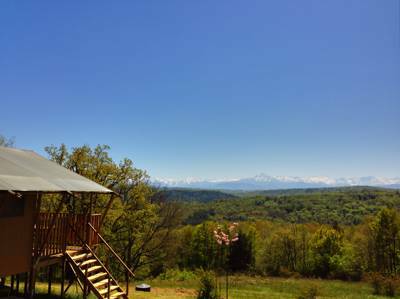 This fully-equipped safari tent has a fantastic vantage point from which to admire the distant Pyrenees. This safari tent sleeps up to six guests and sits at the top of a south-facing, four-acre meadow, with constantly-changing views of the Pyrenees. The safari tents are separated by a copse of young silver birch trees. The meadow slopes downwards through the forests with views to the wooded valleys and hills beyond, you also will have the most spectacular views of the Pyrenean mountains. The views are spellbinding and change every day - from misty surreal mornings where snowy peaks float on pink clouds, to black silhouetted mountains against a firery orange sunset, which darkens to a dazzling starlit sky. The meadow and surrounding forest is untouched, except for a few mown paths and sitting areas which are surrounded by plants and hopefully you will catch a glimpse of deer, badgers, squirrels and numerous birds of prey. Each tent is situated roughly 40 metres apart on a sturdily built raised deck which incorporates a 3m x 5m terrace. The terrace is shaded and furnished with comfortable sofas and chairs and a coffee table - providing an ideal place torelax and to take in the wonderful views. To add to the exciting experience of sleeping under canvas each tent also has it's own fire pit area with a low level metal brazier, which doubles as a BBQ. There is plenty of fire wood to be found on the surrounding forest floor, and children and grown ups alike love exploring and collecting the wood for the evening camp fire. The tents are equipped with a kitchen unit with stainless steal 4 burner gas hob and a sink. They each have two large bedrooms with comfortable beds and a sofa bed in the lounge area. They also have an internal enclosed wooden cabin shower room with flushing toilet and washbasin. All facilities are plumbed in with hot & cold water and have proper drainage, and there is also a washing machine on site. Low wattage hairdryers are in each shower room and there is a socket for charging your mobile phone, laptops but please don't bring high powered appliances e.g 2000 watt hairdryers and hair straighteners. Pure cotton bed linen / towels / pool towels & tea towels are included in the cost of the rental. There is also a washing machine on site. Wifi is provided free of charge but the signal can be slow at times in the countryside, 3G is often a better choice if you want to stream movies etc. Mains electric fridges and separate freezers are in each tent, with a supply of freezer packs for the large cool box - which is also provided. The lighting in the tent is a combination of electric lights and solar lights - There are also solar lanterns hanging from the trees to light your way on the pathways - making it a really magical walk in the evening. Around the edge of the meadow there are hammocks and tree swings hanging from oak trees, providing dappled shade for relaxation or play. For complete relaxation you can bask in the large heated jacuzzi hidden away under its own shaded pergola overlooking the meadow and where you can gaze at the incredible views, spectacular sunsets and later in the evening looking up at the starlit sky. If you are feeling more energetic there is a swimming pool placed a little further down the meadow for the sole use of people staying in the safari tents, it has a sunbathing area next to the pool and a wood and bamboo pergola for shade. A refundable breakages, security & additional cleaning deposit of £150/200 € is required to be paid on or before arrival. Toubies Glamping is in a truly stunning location - just two luxury lodge safari tents ecah sleeping up to 6 people is on a south facing 4 acre meadow surrounded by oak forests with the most spectacular views of the pyrenees. Toubies is in a secluded location but has great access to many activities in the area including hiking, walking, cycling (bike hire is available) canoeing, exploring caves and underground rivers, parapenting, high zip wires through the trees, the list is endless. For the less energetic there are the local traditional villages and medieval towns steeped in history, with bustling markets and restaurants serving delicious local produce. We are also only an hour from the beautiful city of Toulouse where you can wander for hours amongst the pretty cobbled streets or shop in the main boulevards; and for those interested in space exploration and technology don’t miss a day visit to the “Cite Espace”! Safari tents each have a double bed, 2 single beds and a day bed which converts into a large double in the lounge (bedding and towels provided; 6 people maximum). They each have a wood kitchen unit with a 4-burner gas hob, sink, counter height fridge with freezer compartment and a cool-box; en suite, wood cabin-style shower room, with flushing toilet and washbasin; low wattage hairdryers; sockets for phone or laptop charging; and Wi-Fi (free). Pathways and car parks are lit at night by solar lamps. Just outside each tent there’s a firepit area with a low level metal brazier, which doubles as a BBQ. Shady hammock areas in the trees, swimming pool and sun-lounging area, plus the special ‘spa pool’ next to a cushioned seating area. For local amenities, guests can walk directly from their tents, along a forest path to St Croix Volvestre in about 20 minutes. The village has a general store, lovely bar-restaurant, pharmacy, tourist office and a beautiful swimming and fishing lake surrounded by grassy banks and picnic areas. It’s an excellent spot for a little wild swimming. In the public area around the lake you will also find 2 all-weather tennis courts, boules courts and a playground. Walking back takes slightly longer than 20 minutes, as it's uphill, but it's through the trees so you can keep cool while keeping fit. Driving takes 5 minutes. The pre-historic caves at Maz d'Azil (0033 5 6169 9771) are highly recommended – they are over 30,000 years old – while the nearby towns of Cazeres and St Girons are positively modern by comparison but are still wonderfully historic old places, with busy markets, cafés and restaurants. There are also outdoor theatre productions in the grounds of the 11th century church in Tourtouse, worthwhile if your French is up to scratch! The best of the local markets nearby are in Montbrun Bocage, St Croix Volvestre, Cazeres and St Girons. There are also plenty of bar-restaurants in the area. Le Poulpe, a lovely bistro in the local villages of St Croix Volvestre, and Le Fils de Volp (0033 5 6197 5073) in the village of Le Plan, are particularly good and both only 5 minute’s drive from the campsite. Recent recommendations with contact details are provided in the local information pack in each tent. Sat Navs work fine if you enter ‘Toubies’ or ‘Lieu dit Toubie’. Driving from the direction of Toulouse: take the A64 towards Tarbes and Lourdes. Leave at exit 23 Cazeres. Follow the signs to Cazeres and continue through the town, over the bridge over the Garonne River until the roundabout. Take the second exit from the roundabout towards to St Croix Volvestre. Follow the road until you come to the village of Le Plan. Turn right at the roundabout and then left over the bridge signposted to Montberaud. Continue on this road until you see Montberaud Church on your left. Continue for a further 3km until you see the sign on your right for Toubies. Turn into the private lane to Toubies and park on the lane by the sign. The nearest train station is in Cazeres, a 15-minute drive away, and has frequent trains to Toulouse. There are no buses. To make the most of the area, using a car is highly recommended. 2 fully-furnished safari tents (sleeping up to 6 in each tent) spaced 40 metres apart.